1.Regular dusting and cleaning is recommended to maintain a fresh appearance. Size: diameter-13.7inches ,Material:silk ,Environmental Friendly Material:Nontoxic, odour-free, exquisite and durable. 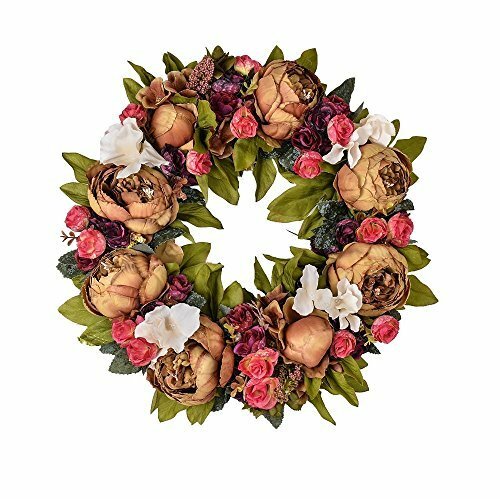 The wreath is made of artificial flowers ,mainly rose and blooming peony .Super Simulate Design: Looks like real flowers, elegant and charming. Widely used: Suitable for decoration, wedding scene, photography background ,indoor and outdoor making it a versatile decorating accessory. Hang it above your fireplace, place it on your front door, or on a living room wall. This wreath will bring an enjoyable ambiance all year round. If you have any questions about this product by LOUHO, contact us by completing and submitting the form below. If you are looking for a specif part number, please include it with your message.